Experience a Mars landing and then work your way through the challenges of living on the Martian surface: manage the Base Operations Center on Mars, grow and harvest plants in the Botany Lab, and collect and analyze data that will be sent to real NASA scientists. Rookie Astronauts will also need to optimize energy intake for the Base by programming robots to clear debris from solar panels. Teamwork, communication, and collaboration skills are developed as participants assist one another through a series of challenges. An unmanned resupply ship from Earth, has broken apart during landing, strewing pieces of hull, engine and payload over a large area surrounding Mars Base 1 and its outposts. New crew has just arrived for a duty shift in the Base Operations Center and must handle this emergency until the regular Ops Crew returns from their break. Food and oxygen supply for MB1 comes from greenhouses. In the Plant Lab, research is done to test new plant varieties, growth media, lighting treatments and nutrients to determine which crops will best meet a variety of nutritional needs for the residents. 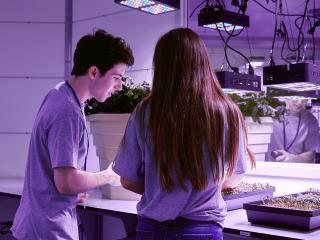 Conduct real, controlled scientific experiments on a range of herbs, fruits and vegetables. MB1 relies on photovoltaic panels to provide solar energy for many systems, dust migration is a constant priority, and many different systems have been tested and implemented. Check in at 9.00am for a 9.30am start. Check-in at the new ATX Facility to the right hand side of the general entry gate at Kennedy Space Center Visitor Complex. Please Note: Your ticket does not include entrance to the exhibits at Kennedy Space Center Visitor Complex – you must purchase an Admission Badge or a Space Pass should you wish to explore these areas. Mars Base 1 participants must be 10 years of age or older. Participants under the age of 18 must be accompanied by an adult. Kennedy Space Center is located in Cape Canaveral, an easy 60-minute drive east of Orlando. Do I need to book a date for the MARS BASE 1? The MARS BASE 1 Training programme is a reservation only experience so you must book at date at the time of booking. Does my MARS BASE 1 Ticket include access to the other exhibits at Kennedy Space Center Visitors Complex? No, if you would like to explore Kennedy Space Center Space Center Visitors Complex, you must by a separate admission ticket. Please see our Admission Badge and Space Pass options.